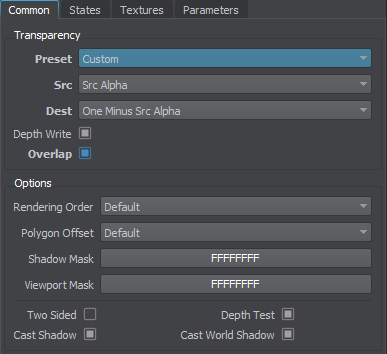 Sort order used when rendering transparent objects with alpha blending. 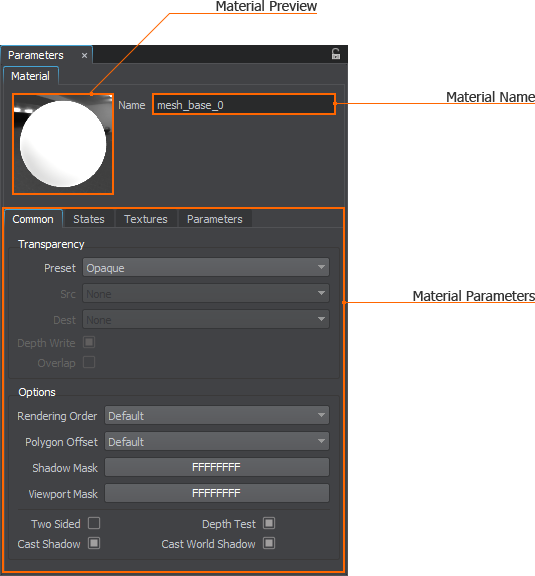 Transparent objects should be set the lowest order numbers and thus rendered first, while opaque objects should be set the highest order numbers to be rendered last. A shadow mask of the material. A surface, having this material assigned, casts shadows from a light source, if its shadow mask and the material shadow mask match the mask of a light source (one bit, at least). A viewport mask of the material. A surface, having this material assigned, will be rendered into a viewport, if its viewport mask and the material viewport mask match the viewport mask of the camera (one bit, at least). Toggle depth testing for the material on and off. This can be used to make objects occluded by others visible (e.g. a character behind a wall). Render polygons, to which the material is applied, casting shadows from omni, projected or cubemap light sources. 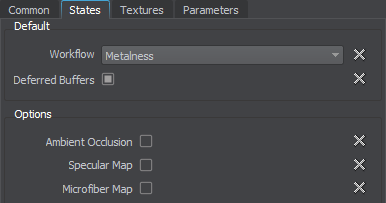 The States tab contains a set of flags that will be used for a shader corresponding to the material.